Seated: (L-R): Archpriest Theodore Zisis, His Beatitude, the Catholicos-Patriarch of All Georgia, Ilia II, Professor of Dogmatic Theology, Demetrios Tselengidis, Hieromonk Miqaeli Bregvadze, Monk Seraphim (Zisis); Standing: (L-R): Hierodeacon Peter, Archpriest Symeon, Protopresbyter Peter Heers, Protopresbyter Matthew Vulcanescu, Metropolitan of Zugdidi and Tsaishi, Gerasimos (Sharashenidze), Metropolitan of Alaverdi, David (Makharadze), Archbishop of Stepantsminda and Khevi, Iegudiel (Tabatadze), Metropolitan of Akhaltsikhe and Tao-Klarjeti, Theodore (Chuadze), Protopresbyter Anastasios Gotsopoulos, Archpriest Bessarion. FROM July 25th through July 28th an ecclesiastical delegation of clergy from the Church of Greece were visitors to and the guests of the Patriarchate of the Georgia and His Beatitude the Catholicos-Patriarch of All Georgia, Ilia II. The delegation consisted of Archpriest and Professor Emeritus of Patrology of the Theological School of the University of Thessaloniki, Fr. Theodore Zisis, Professor of Dogmatic Theology in the Department of Theology of the Theological School of the University of Thessaloniki, Demetrios Tselengidis, Protopresbyter and Rector of the Parish of St. Nicholas of the Diocese of Patra, Fr. Anastasios Gotsopoulos, Protopresbyter and Rector of the Parish of the Prophet Elias, Petrokerasa, in the Diocese of Ierissou and Agion Oros, Fr. Peter Heers, and Protopresbyter and Rector of the Parish of All-Holy Directress, Bokos Hill, in the Diocese of Peiraeus, Fr. Matthew Vulcanescu. In a series of meetings with hierarchs of the Apostolic Orthodox Church of Georgia responsible for inter-Orthodox affairs, as well as with the Catholicos-Patriarch of All Georgia, His Beatitude Ilia II, who graciously received and honored his guests at his summer residence, the delegation was warmly received in a spirit of brotherly love and sincere cooperation and shown exceptional hospitality over their 5 day stay. The purpose of the delegation's visit was twofold: on the one hand to express - on behalf of all faithful Orthodox Christians in Greece - their heartfelt gratitude to the Patriarch, Hierarchy and Faithful of the Venerable and Martyric Church of Georgia for their confession of the Orthodox Faith over and against the rise - in council - of syncretistic ecumenism, and, on other hand, to consult and discuss in person with His Beatitude and Hierarchs the proper response to the unorthodox "Council of Crete." In particular, the Georgian Church's faithfulness to Orthodox ecclesiology, as evidenced in the now twenty-year old decision to depart and remain apart from the syncretistic-ecumenist, Protestant-dominated body, the so-called "World Council of Churches," was praised and held up as a model for all Orthodox Churches. This faithfulness was, moreover, most evident in the stance the Church has maintained via-a-vis the texts and organization of the mis-labeled "Great and Holy Council," an episcopal conference of a small portion of bishops representing less than half of the Orthodox faithful, which was held this past June in Crete. The discussions centered on the problems created by the innovative and unorthodox "Council in Crete" and the necessary response to it based upon the dogmas and canons of the Church and Orthodox ecclesiology. 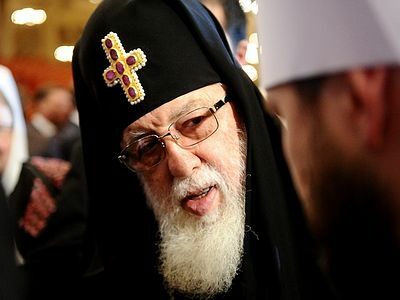 The need for a clear rejection of both the methodology and organization of the Council, as well as the innovative and unorthodox texts adopted at the Council, and for a new, Orthodox Council to be called in response, was stressed by the Greek delegation. The Patriarch welcomed his guests and praised their love and devotion to the Church and Faith, assuring them that "there are not many churches, but only one Church, the Orthodox Church," and that he and the Holy Synod will "work for the unity of all of the Orthodox," which can only be assured on the basis of the faith once delivered. 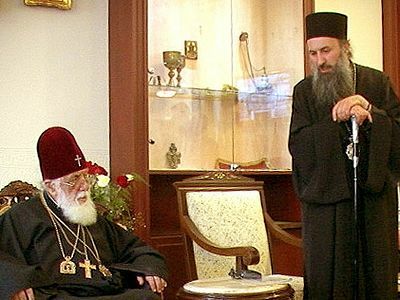 The representatives of the Church of Georgia to the pan-Orthodox conferences, Metropolitans Gerasimos of Zugdidi and Theodoros of Akhaltsikhe, also, for their part, stressed their Church's commitment to their pre-conciliar rejection of the unorthodox texts "The Sacrament of Marriage and Its Impediments" and "Relations of the Orthodox Church with the Rest of the Christian World." 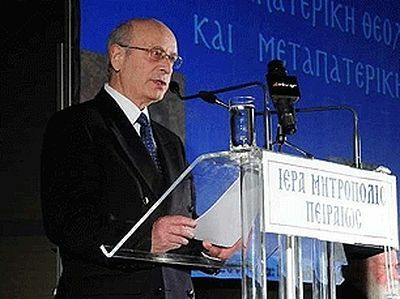 Furthermore, the Patriarch and Metroplitans also stated that the documents of the Council will be translated into Georgian and examined and an official response will be issued after the general meeting of the Hierarchy in October. In general, both the guests and the hosts found common ground and oneness of mind on all matters of faith with respect to the Dogma of the Church and Her boundaries and the need to continue unwavering in the Orthodox Confession of Faith in the face of the spread of syncretistic ecumenism. They pledged to continue cooperation in this regard in the immediate future. In addition to the above mentioned meetings and discussions, the gracious hospitality for which the Georgian people are so well-known was extended to the visiting clergy with a full program of visits to historic pilgrimage sites of venerable Church of Georgia.